Ground will be broken Wednesday for the 17-story Bridge apartment building, which will rise in the shadow of the Ben Franklin Bridge in Old City. After 14 years of attempted development, there will finally be a groundbreaking ceremony Wednesday for Bridge, a 17-story high-rise at 205 Race St. that will bring a new look to the riverfront in Old City. Bridge will join another high-rise project nearby, One Water Street. Tom Corcoran, president of the Delaware River Waterfront Corporation, said the two buildings will transform the area near the Benjamin Franklin Bridge. “In the space of about a year to 15 months, you’re going to have 650 new people living right on the waterfront for all practical purposes, and that’s going to create a lot of excitement and a lot [of] opportunity for more development and more active use of the waterfront,” Corcoran said. "It's quite transformative...and it will be a much, much better improvement than an empty lot," said developer Jeff Brown. An empty lot was all there was in 2001, when Brown Hill Development bought the property. Low rents, high construction costs and the Great Recession helped keep the shovels from coming out. New economic and demographic factors, however, have come together to make it the right time for construction, say real estate experts. “It’s probably fair to say that as the city continues to grow, high-rise buildings will become more prevalent because they bring the density and they bring the population to the areas they want to be in the most,” said Brown. 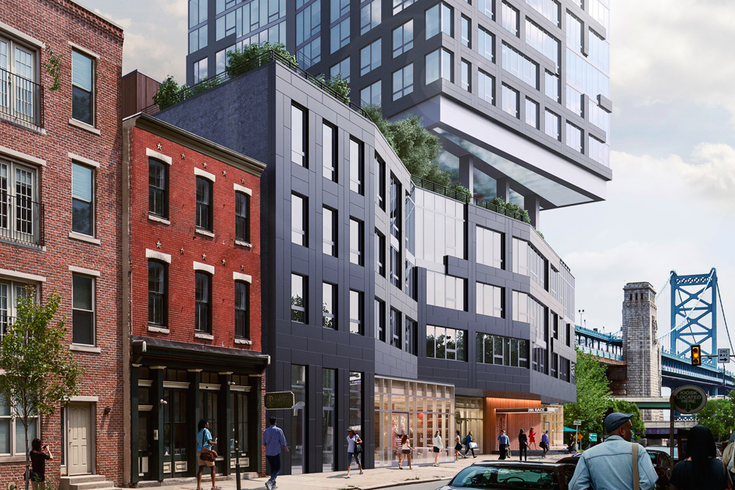 The developer doesn’t think high-rises will necessarily begin popping up all over Old City, but Bridge does represent changing trend lines – and skylines. "What we’re seeing more and more of today, is a continuing increase of inner-city population, and with that an increase in the demand for apartments,” he said. The building's name is a nod to the Benjamin Franklin Bridge next door. It will aim for LEED Gold certification, offer retail on the ground level and rent out 146 units, 15 of which will be set aside for affordable housing (defined as rents low enough that someone who makes 80 percent of the area median income can afford it). On the fifth floor, a 12,000-square-foot amenity deck will include a co-working lounge and gym, plus an outdoor space with hammocks and outdoor seating and six private barbecue areas. The price tag: $65 million, including a $45 million loan from Citizens Bank. 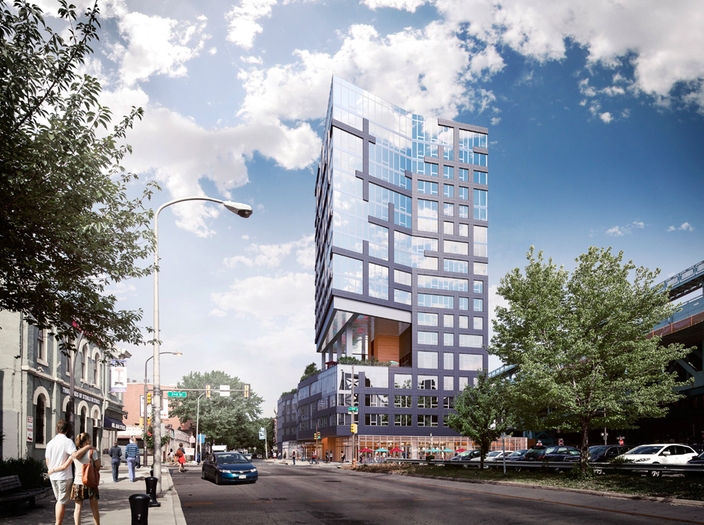 When Brown Hill Development, known for projects like the 12-story condo building at 108 Arch St. and the FringeArts headquarters, bought the lot in 2001, it had yet to develop a vision for the project. At the time, zoning regulations stood in the way of large-scale development. It was only in 2013 that the city council passed an ordinance recognizing a “Bridge Approach District” near the big blue bridge, paving the way for high-rises in the neighborhood. People also raised concerns about height and population density. “We made several attempts in the past. We had some opposition from the Old City Civic Association; we had some other rules and regulations by the city code that made some of the designs challenging,” Brown said. Brown says that a combination of economics and demographics make the time right for high-rises. Vacancy rates in Center City, for example, are less than 2 percent. “Many things have changed. The rents in Center City Philadelphia have increased; the population’s increased dramatically; the education and the demographics of that inner-city population get better every day,” he said. The Old City Civic Association itself disbanded in 2013. “I think everybody wants to see Old City retain its character … this one building tucked up right up against the Benjamin Franklin Bridge should not detract from the charm of Old City at all,” Corcoran said. Zoning ordinances limit building heights to 10 stories unless the developer includes certain amenities like retail, Corcoran said. “We love the location and we were waiting for the perfect time,” he said. It looks like that time has arrived at last.